If you find the Mercedes-Benz A45 AMG too small, the Porsche Macan too expensive and always wished for a Subaru Forester STI, here comes the right car for you: A crossover with what's still the most powerful series-production four-cylinder engine in the world. 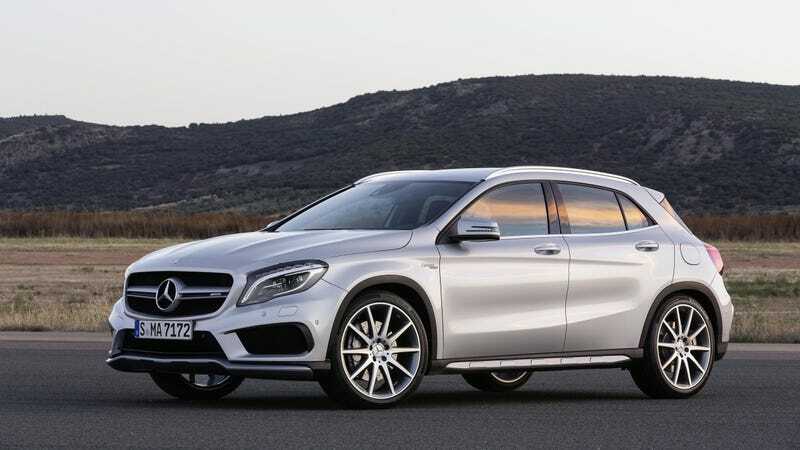 Unlike my subcompact, the small displacement fourbanger in the The GLA45 AMG propels it from 0-62 in 4.8 seconds and goes up to an electronically-limited 155 mph. To get all that juice from a its hand built two-liter, Mercedes used a twin-scroll turbo with an air-to-water intercooler, forged pistons, cylinder liners glazed in some sort of magical liquid using nanotechnology, a cast aluminum crankcase and a forged steel crankshaft. So yes, the GLA45 AMG is still just like the A45 AMG, only fatter. This beefed up urban adventurer also gets a sports exhaust system with exhaust flap, start-stop and all-wheel drive as standard, which uses front-wheel drive but can split the torque between the front and rear axles up to a ratio of 50:50 percent if needed. Thanks to the direct injection, multiple spark ignition and the up to five injections per combustion cycle at a dieselish 200 bars, it also promises 37.6 mpg (NEDC combined, so the US figure should be much lower). There is no manual option, but the transmission is the new Speedshift DCT 7-Speed automatic instead of the slowish MCT from previous AMG offerings. You get three modes depending on your needs, and there's launch control for those who want to try to shave off a bit from the official acceleration figure. The MacPherson up front is fitted with stiffer steering knuckles and new elastokinematics. The four-link rear axle is also unique to the AMG model. For those who want to make their crossover even less capable on rough surfaces, a performance suspension with firmer spring and damper tuning is available as an extra. Just like the red brake calipers, as the standard brakes come with grey ones.